Book in the month of April or May and receive 10% off the nightly rate. B208 at the Point at Mauna Lani is a 2 bedroom, 2.5 bath OceanView Villa. Your view includes the Signature 15th hole of the Mauna Lani South Course, Ocean Views and a view of the lovely black sands of Honokaope Bay. The lanai is furnished with the tropical outdoor dining and relaxation in mind. The serenity, comfort and views combine to create the perfect location for memorable sunrises and sunsets. The glass doors to the lanai open up to provide you with breathtaking views from the within the villa. The condo is beautifully and tastefully designed with your vacation in mind. The kitchen is open and spacious, everything you will need to prepare meals for family and friends. The master suite includes a king sized bed and the master bath includes a large walk in shower. 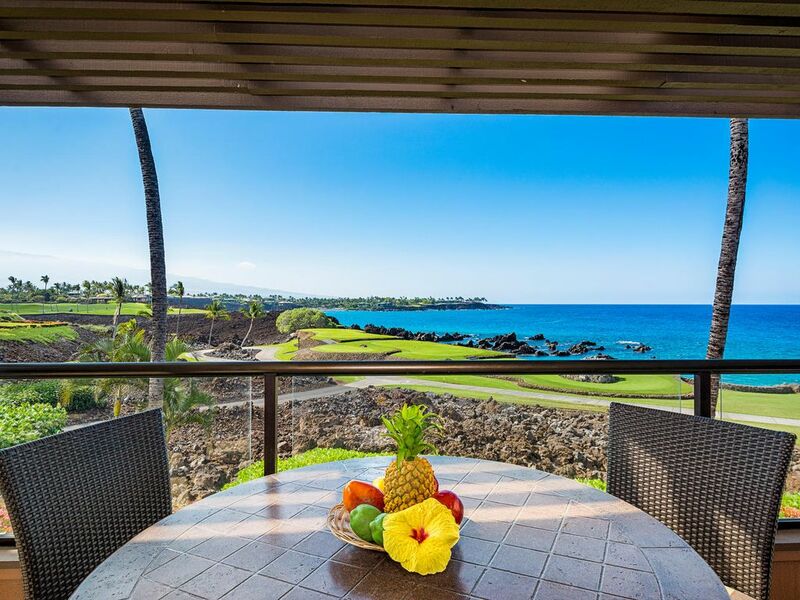 Nothing matches the quite enjoyment you can have here at the Mauna Lani point in Villa B208. The cancelation policy is: Full refund up to 60 days prior to arrival. 50% refund from 30 to 59 days and no refund inside of 30 days. Magical Hawaii Sunsets and Amazing snokling right off the balcony. A week in paradise! The condo was so clean and comfortable. We enjoyed the most amazing sunsets over the 15th green. Snorkeling in the cove and the beach club were the cherry on top. So excited to come back in December. Thank you for allowing us to host you. The View was absolutely breathtaking and the sunsets magical. Here were the issues that we had........ the (3) TV's worked intermittently and had to be serviced once and we didn't bother calling the second time because we were trying to enjoy our vacation. The HVAC doesn't circulate well in the back bedroom (we called for service on that). There was only (1) blow dryer between (3) bathrooms. The cutlery knives desperately need sharpening would could barely cut through fruits and vegetables. Thank you for your feedback we have addressed your feedback. A wonderful stay in a beautiful condo with a breathtaking view. No complaints at all. Danielle Bates at Hawaii Luxury Real Estate was our agent and she was great in meeting all our needs. It was very nice to host your you.